Darren Criss has been making Broadway audiences swoon (and packing the house at the Al Hirschfeld Theatre) as How to Succeed in Business Without Really Trying's new window washer, so Broadway.com resident artist Justin ‘Squigs’ Robertson couldn't resist capturing the Glee star in action in his Main Stem debut. Criss plays J. Pierrepont Finch, a newly appointed mailroom clerk who attempts to climb the corporate ladder with help from a how-to book. 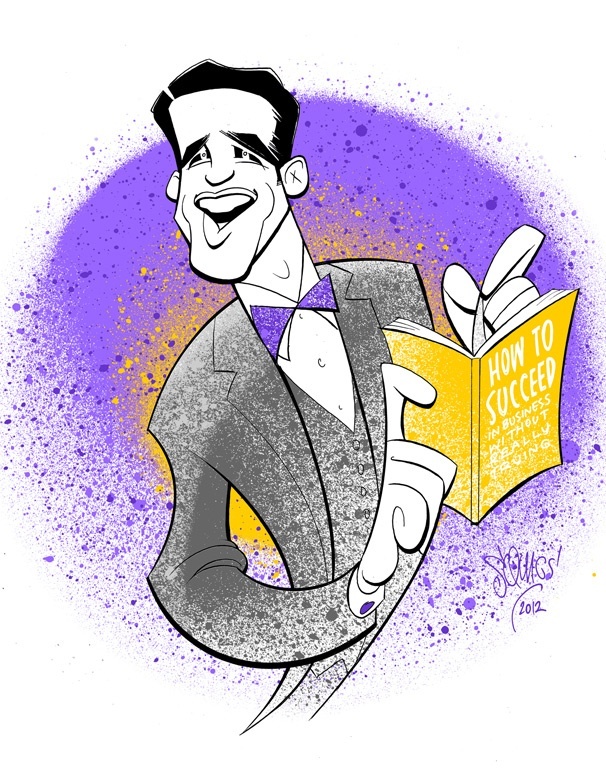 Check out Squigs’ portrait of Broadway’s new heartthrob, guidebook in hand, then head to Broadway before January 22 to see Criss in this limited engagement. About the Artist: With a desire to celebrate the magic of live theater and those who create it, and with a deep reverence for such touchstones as the work of Al Hirschfeld and the wall at Sardi’s, Squigs is happy and grateful to be among those carrying on the traditions where theater and caricature meet. He was born and raised in Oregon, lived in Los Angeles for quite a long time and now calls New York City his home. Click to e-mail Squigs.